wow! here i am, in my new parish, Annunciation of the Lord! the transition has begun, and this past weekend was a great start! i introduced myself to everyone by quoting Dorothy, "there's no place like home, there's no place like home." don't tell anyone, but i still haven't seen the full movie. i have been ordained and helping out at the Cathedral this past summer, but there's something different now ... i can't quite explain it yet. but i think i like it. anywho, i continued, as is my custom now, with: "i'm your new baby priest, the new kid on the block." this brought up an image in my head, which you now see! 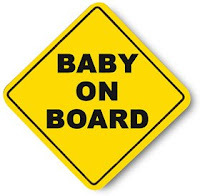 i was thinking it would be best for all if this was put in the window of the parish, just for safety precautions. i am new and i've asked all to be patient with me as i begin my new life as a priest, and more importantly, as the new associate pastor of Annunciation of the Lord parish. i'm honoured to be here with you all!!! today we celebrate the 150th anniversary of Saint John Vianney - the patron saint of all priests. i had the opportunity to celebrate mass this morning and was particularly moved by the whole celebration with all of the parishioners. there's a great story of him beginning his ministry as well. after three years of ordination he was called to be pastor of Ars, a small village in France. he set out for this village and got lost. he lost his way. therefore, on the country road he asks a boy the way to Ars. the boy responds, "that way". thankful, St. John responds with, "you have showed me the way to Ars, i will show you the way to heaven." powerful! that's what i said to the taxi driver who took me to Annunciation. [not really]. this story has been preserved in a statue depicting this moment in history. as a new priest, and associate pastor, i'm asking St. John to pray for me, and all the new guys, in a special way. this brings me back to the title. indeed, that which i cannot describe, as previously alluded to, can somehow be seen in our cry to see God! wanting to see Him face to face is what prayer is all about. when we take time from our busy schedule, taking time in silence, we get a glimpse of who God is, who we are, and what He has in mind for us. i experienced this in a very real way 6years ago when i left everything to follow Him who was calling me. the journey since then has been full of joys and sorrows. it has been anything but smooth sailing. however, after ordination to the priesthood i had forgotten all my past sufferings. and now, i am at peace, in my new home. i have met the face of God, for the second time, through the parishionners of Annunciation and their welcome of the new associate pastor. i'm not overexagerating. in fact, the joy of Jesus Christ, never comes out quite right in words. i feel i need to say more, but i cannot. i pray that all can share in my joy one day - the joy of Jesus Christ. i now continue my journey with all at Annunciation. i played Ultimate frisbee with the youth last night, celebrated the Sacraments of the Eucharist and Reconcilation, trying to move into my new office, getting my voice message just right, unpacking my books, and as St. John used to do, trying to stay rooted in prayer through out it all. united in prayer. peace out. I am very excited to see you celebrate mass in our parish when we get back from Impact. Hopefully we'll be there the last Sunday of August. looking forward in seeing you and the family again! the priests of the Archdiocese are on retreat Aug. 31, but i should be there on that last Sunday of this month. enjoy Impact, and know you are in my prayers. peace.